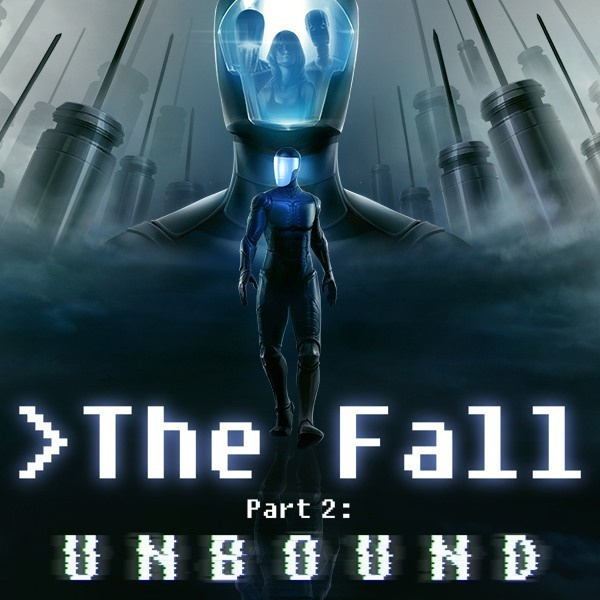 The Fall Part 2: Unbound continues the story of an AI seeking to burst through its technological limitations and evolve, so it's perhaps appropriate that this is a Switch sequel to a game that originally appeared on the Wii U. 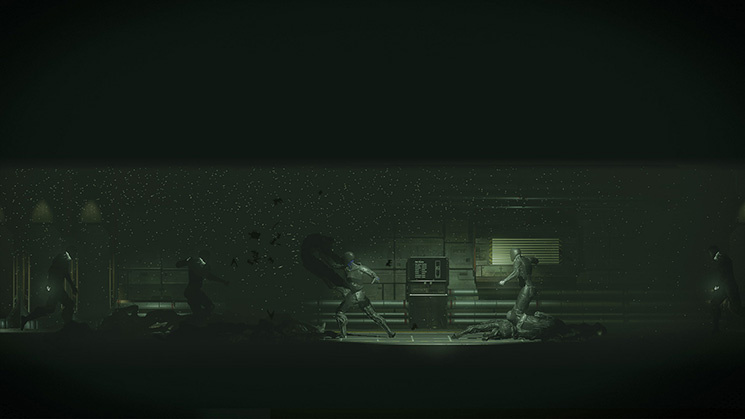 As in The Fall, you play the part of A.R.I.D, an advanced AI with a skill for manipulating robotic systems. Both story and gameplay follow on directly from the original game, but there's a very brief (arguably too brief) summary of the events of The Fall at the outset. Fresh players shouldn't be too confused, but some reference points will be lost on them. What it all amounts to is this: you, as a disembodied A.R.I.D, are forced to defend yourself against the attacks (both virtual and physical) of a mysterious human user. You must crack through cyber defences and inhabit several robot avatars in a bid to fulfil your new purpose to 'Save Yourself'. Early impressions of the game can prove misleading to the uninitiated. What initially seems to be an explorative Metroidvania actually turns out to be far closer to a traditional point-and-click adventure. 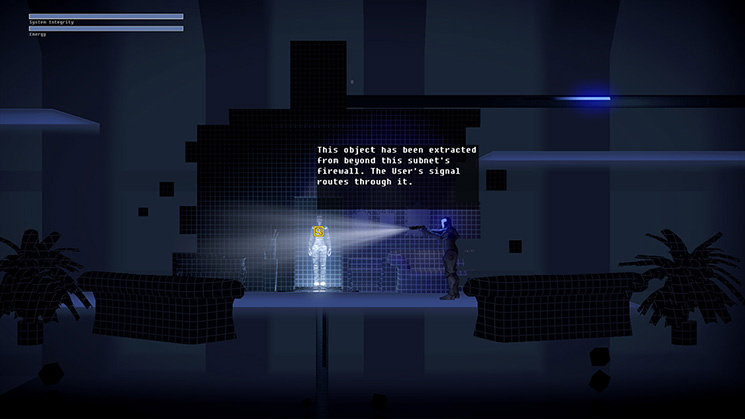 The game switches between action-packed platforming sections, which represent your character's TRON-like journey through the circuits of a computer system, and puzzle-driven scenarios where you must follow and exploit the rigid behavioural patterns of a butler, a self-obsessed combat droid, and a 'companion' robot. The former sections incorporate simplistic gun combat and platformer exploration. The controls here are more than a little stilted, as you raise your weapon by first pressing the ZL button, then aim by pressing up and down on the right Joy-Con analog stick, before pressing ZR to shoot. This is also how you interact with items in both worlds, literally aiming at the point of interest (as designated by a tiny question mark), and then press A to bring up a context-sensitive interaction menu. It all feels rather fiddly and several stages too long - especially when it turns out that most items of interest aren't interactive at all. In a way, these controls really sell the premise of the story, because it really does feel like you're controlling an AI that's controlling a character. You very much feel one step removed from the action, with a critical lack of tactile connection to your character. These somewhat vague controls seem to point to a game that was built initially with PC in mind, and they also suggest a game that's more comfortable with adventure-style puzzling than action. That's only partially true, though. TFP2:U's role-inhabiting adventure sections are certainly far more interesting than their action-focused companions. While the latter feel a bit like a pale Super Metroid tribute at times, stepping into the shoes of a robot in the game's futuristic 'real' world allows the game to explore some fairly mature themes and ask some provocative questions concerning A.R.I.D's motives. Questions of identity and self-determination are pretty common in sci-fi fiction these days, of course, but the narrative in TFP2:U manages to feel relatively fresh all the same. It's a shame that the actual gameplay in these adventure sections isn't always up to scratch. Those stilted controls and tiny question mark prompts get in the way of proper exploration - you end up walking through each scene scanning around for interaction points rather than taking in the game's moody silhouetted scenes. This is particularly so because the path to each solution is quite linear and also rather obscure. At certain points you will almost certainly find yourself wandering around its small levels clicking on everything to try and uncover the correct prompt to move the story forward. Point and click adventure veterans will probably be well prepared for this, but the game's logic simply doesn't always shine out obviously enough for the average player. 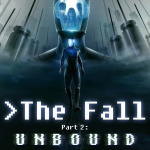 The Fall Part 2: Unbound continues the story from The Fall with an interesting angle on familiar sci-fi concepts, but the game that underpins this darkly cerebral world is somewhat lacking. Both its action and adventure elements suffer from stilted controls, and the imaginatively conceived point-and-click sections don't always leave a satisfying breadcrumb trail for the player to follow. 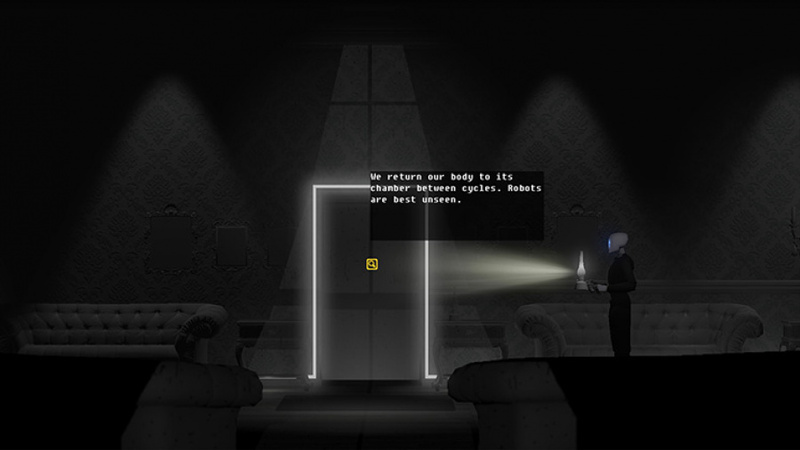 The result is a game that's as frustratingly flawed as it is thought-provoking. Did they release the first Part already on the Switch? On the strength of my enjoyment of the first game on Wii U (a game itself which some might consider flawed and frustrating too) I'll certainly be buying this for Switch. The story, themes and aesthetic were fascinating. Just might have to wait as I already have too many games in my wish list to buy, not too mention the growing backlog of games unfinished and too little money to spend on every release that takes my fancy. Signs that the Switch is offering decent content and choice though. Well, for me at least, lol! These game review are coming thick and fast, how many reviewers are up there in Nintendo Towers, and are they allowed out? @hakjie11 The studio told to us in a interview that he will release soon The Fall part 1 on the Switch. 6/10 dont affect me, really. The Fall part 1 was so good at my eyes. A total different genre of game that im used to. I just waiting to 12h00pm east time to buy it on eshop. Im sure its gonna be a 8/10 for me. A.R.I.D deserve our attention. This game will improved with Nvidia next gen processors. Part 1 had its limitations as well but it didn’t stop me from enjoying the game. I will be purchasing part 2 for sure. I’m also hoping that by the time part 3 comes out, there would be a physical release. I really loved the storytelling of the first game and am looking forward to continuing ARID's journey in part 2! I love the moral dilemna's. If this game is ANYTHING like the first one the review score doesn't reflect reality for me. I have yet to play Part 2 since it will first be out in 30 minutes but when it comes out I will purchase it FIRST THING. In before that Wii U guys complaints that this sequel isn’t releasing on that console. I for one am excite. Got the first one in a humble bundle and I wanted to keep playing once the credits rolled. I just started playing it, really like the game a lot just like I did with the first one. I'm getting the game tonight! I started to collect simple indie games and they are surprisingly fun. It is stress free compared to games I owned like Monster Hunter World and Horizon on my PS4. But really, I really enjoy games like what they say "mobile games" because that's what Switch is all about. I love it. The Fall 2 shows how great a 6/10 game can be. So it is exactly the same as part one, then? That's fine for me. I really liked the first one. I will probably buy it on Steam, the controls work a lot better with mouse and keyboard.